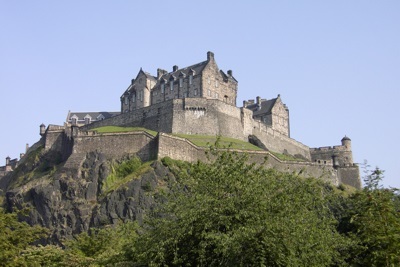 Edinburgh Castle is probably the best known building in Edinburgh. It overlooks the city from Castle Rock, dominating the skyline. There is archaeological evidence of human habitation on the site since at least the 9th century BC. However, most of the castle buildings actually date to the 16th century - although the oldest building on the site is St. Margaret's Chapel, which was built in the early 12th century, and is in fact the oldest building in the whole of the city. During August of each year, the Edinburgh Military Tattoo takes place. It involves pipes and drums of Scottish regiments, as well as other invited performers. The Honours of Scotland (the "Scottish Crown Jewels"), and the Stone of Destiny (the "Stone of Scone") are stored in the Crown Room at Edinburgh Castle. As a result, military sentries guard the site. Except on Sundays, at exactly 13:00 every day, a gun is fired. This can be heard some miles away, and the tradition dates from the time when such as signal was useful to allow sailing ships on the Firth of Forth to set their marine chronometers. A 15th century siege gun, Mons Meg, can be found outside St. Magaret's Chapel.